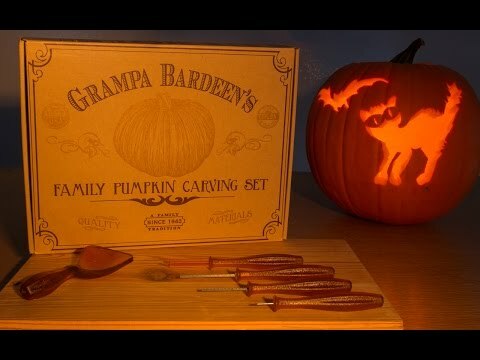 Grampa Bardeen’s pumpkin carving kit contains easy-to-use tools designed for safer and more accurate carving. With enough tools to share, and many templates for inspiration, carve your best-ever pumpkins with the entire family. Box Dimensions: 12" x 9.38" x 2.13"
I was very happy with my set. The kids never even needed help with the carving. The handles are perfect for for gripping. This should last for years to come! I love how sweetly this is packed with family pride! Impressive quality & very informative. I can’t wait to use it with my kids. 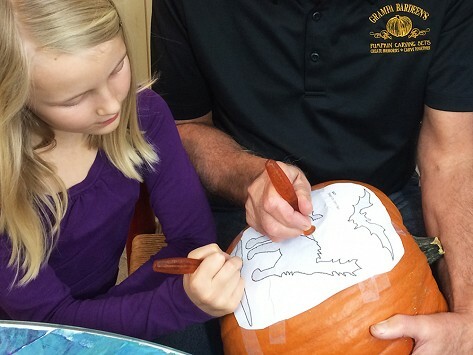 Grampa Bardeen’s is here to help you carve amazing pumpkins—and create lasting memories—with your family. The whole Grampa Bardeen’s kit is Made in the USA and designed to last a lifetime. Two rows of pumpkin carving tools let an entire group work at once. The small saws, drills, and pokers make more intricate and accurate pictures, and their teflon-coated handles are easy to rinse off. Two scrapers deftly hollow out seeds. To inspire your designs, there are several templates and many carving tips inside, too. Grampa Bardeen’s is a small business started by several brothers and sisters to honor their dad. An all-around handyman, he created carving tools for them that were simpler and safer to use than kitchen knives. The Bardeen family was a neighborhood hit at Halloween, trick-or-treating with their jack-o’-lanterns instead of in costumes. Let Grampa Bardeen’s help turn your pumpkins into works of art. Whether you’ve got a family of skilled carvers or a group of novices, this comprehensive kit will inspire a whole new crop of creativity.